The Golden Dames Project - Page 4: Experimentation! Spotlighting the amazing women from the golden age of comics in webcomic format. Highlighting the best of the past as an example for the future. Debuting in January of 1940, Planet Comics was a comic book spin-off of Planet Stories, a pulp science fiction magazine. The focus of both Planet Comics and Planet Stories was space opera: powerful young men, beautiful and scantily clad young women, ray guns, space ships, and plenty of technobabble. Planet Comics started off as a monthly book then, perhaps because of paper rationing during World War 2 dropped down to a bimonthly title. Towards the end of the 1940s, Planet Comics was reduced again, this time to a quarterly title. Unfortunately, things didn't improve from there. For three years, 1950, 1951, and 1952, Planet Comics was released annually. After 1952, the title returned to a quarterly release schedule but the last nail was already in the coffin. The final issue of Planet Comics was number 72, released in the fall of 1952. 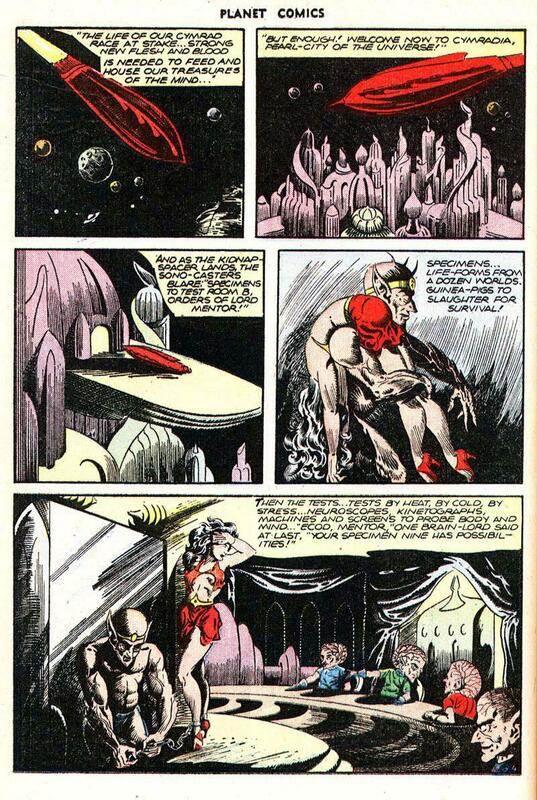 It is notable how many female led features appeared in the pages of Planet Comics. In addition to Futura, female leads included Gale Allen and her Girl Squadron, Mysta of the Moon and Amazona the Mighty Woman. Female characters were also prominently featured in male lead features such as the Lost World, Flint Baker, and the Space Rangers. Cynically, the reason for so any female characters is that many of Planet Comics' readers were men and liked looking at beautiful women in tight and revealing clothing. Despite this, the female characters in Planet Comics spent as much time being capable adventurers as damsels in distress. "Tests by heat, by cold, by stress... neuroscopes, kinetographs, machines and screens to probe body and mind..."
Anyone want to take a guess at just what neuroscopes and kinetographs are? Guest post by "Jasae Bushae"
Of those names you mentioned, im actually vaguely familiar with Mysta. One of my school teachers would keep referencing her as 'the champion of learning' and had a blown up picture of the heroine on a wall. I'd be happy to put Mysta on the list of characters we'll spotlight if you like. She was certainly a champion of learning! Yes, well, it wouldn't be very much of a story if specimen nine didn't show promise, eh? A neuroscope to test the endurance of the mind, and perhaps pain threshold of the body. A kinetograph could be for testing the limits of extra-sensory capability, such as manipulation of objects outside immediate reach... or for testing range of physical movement and power. Obviously measuring kinetic energy and transference. Uh, or could be fer shootin' stuff. Peaches, like with Prince Valiant there's an omniscient third person narrator. A storyteller if you will. Out of curiosity, how many characters do you intend to spotlight? Or do you intend to eventually cover every overlooked heroine of the golden age? I already have about twenty names on my list - mostly characters but a few creators as well. Heck, there are over 150 pages of Futura stories! I could do nothing but that for a whole year... and I've already been asked to revisit her in the future. I might make her a once a month feature. There's plenty more out there. So, the answer is: I'll keep going until either I run out of characters or I'm unable to continue. I'm dedicated to Golden Dames for the long haul. You are looking for the heart from the buttons. All comics presented on the Golden Dames Project are, to the best of our knowledge, in the public domain. Original content is copyright 2014 by J Gray.